Indexes ended the week higher by 1.5%. Stocks started the trading day higher, but lost ground throughout the session to end up in negative territory. The Dow Jones Industrial Average (DJINDICES:^DJI) shed 58 points, or 0.3% and the S&P 500 (SNPINDEX:^GSPC) gave up 4 points, or 0.2%. 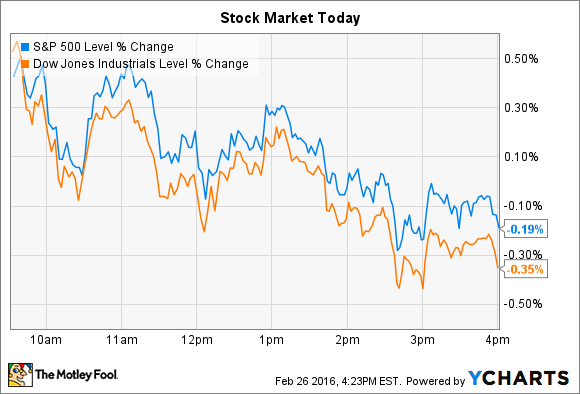 For the week, indexes were both up by 1.5%. Economic growth last quarter was stronger than originally estimated, the government said this morning. Q4 GDP gain was revised to 1% from the initial "advance" estimate of 0.7%, putting 2015's full growth at 2.4%. The higher second reading was driven by greater inventory levels, along with rising imports . Q4's 1% growth still marked a significant decline from the prior quarter's 2% improvement. Meanwhile, stocks making notable price moves today included Universal Display (NASDAQ:OLED) and Herbalife (NYSE:HLF), which moved in opposite directions after posting their quarterly numbers. Universal Display shares lost 12% after the organic light emitting diode (or OLED) specialist posted surprisingly weak fourth-quarter results. Sales rose 11% in Q4, putting the company at zero growth for the 2015 fiscal year, compared to management's recent projections of 3% year-over-year gains. Earnings jumped 40% to $0.39 per share, but still came in well below consensus estimates. Flexible OLED panel. Image source: Universal Display. "Our fourth quarter results were less-than-anticipated," CEO Sidney Rosenblatt explained in a press release, "which we believe was primarily due to year-end inventory management by our customers." Profitability, meanwhile, was hurt by "product mix weighing more to our lower priced emitters," according to the company. Executives reiterated that volatility in the OLED industry makes it hard to predict short-term demand figures, but that doesn't change the bigger picture. "We are confident that this is a long-term growth market," Rosenblatt said . Universal Display sees 2016 as a transition year that lays the foundation for the OLED industry to reach mass market appeal beginning in 2017. The 15% sales jump that the company forecast was significantly lower than Wall Street was hoping for -- and a lot could change before its display technologies catch on -- but today's pessimism could produce an opportunity for investors willing to endure volatility for ownership of this lighting and display tech leader. Herbalife shares rose 24% after the nutrition giant posted improving fourth-quarter results while raising the possibility that a major U.S. Federal Trade Commission investigation into its marketing and business practices may be resolved soon. For the quarter that just closed, sales fell 3%, but rose 10% after accounting for a strengthening U.S. dollar. Net income, which was also affected by currency swings, declined to $85 million from $103 million in the year-ago period. "Despite ongoing currency and macroeconomic challenges, we finished the year returning to growth," CEO Michael Johnson said in a press release. Moreover, management sees its turnaround continuing into 2016, with sales rising as much as 3% for the full year . Yet the bigger story was likely the annual report, filed last night with the SEC, that included talk about a potential end to an FTC probe that's been hanging over the stock. Herbalife noted that it is "currently in discussions with the FTC regarding a potential resolution," that could include a penalty payment as settlement, or may even involve "the closure of these matters without action ." With its minor uptick in sales expected this year, Herbalife clearly isn't a strong growth story, but it doesn't sound like a great short candidate to me, either, especially at the current valuation multiple of just 13 times earnings.